A charming, spacious summer house with pool and gorgeous views. Panayia View, named after the little island it overlooks, sits in a tranquil position amidst a garden of olive groves. It offers airy, flexible interiors, plenty of panoramic terraces, a peaceful ambience and a lovely pool, all within a short walk of the tavernas, bars, harbour, beach and gentle bustle of Gaios Town. The best of both worlds. Inside: accommodation at Panayia is spread over a main house and three separate guest quarters. In the main house, a few steps down from the front door takes one into an open-plan living and dining area, whose white-painted walls, lofty beamed ceilings and large sliding glass doors opening onto a panoramic sea-view terrace, all make for a bright, airy atmosphere, One half of the room is given over to a corner sitting area, the other to a dining table. Wherever you sit, the views over the olive groves to the island of Panayia and out to sea are gorgeous. At the back of this space, a few steps leads up to an attractive, open kitchen overlooking the communal area. A few steps at either end of the living-dining area lead to the bedrooms. To the right is the soothing master bedroom, complete with en-suite shower room and access to a terrace with outdoor shower. To the left, again up a few steps, are two shower rooms and two bedrooms, a twin and a quadruple (a double-twin with extra bunk beds), both with their own access to a lovely terrace with a table tennis table. The other accommodation at Panayia View - a guesthouse and two independently accessed bedrooms - are accessed via a couple of paths running above and below the gardens from main house. The guesthouse comprises large, open-plan. split-level space with high, white-beamed ceilings and banks of large sliding glass doors. From the dining table a few steps lead down to a sitting room and kitchen, off which is a small shower room. Stairs lead up to the first floor, where there is a double bedroom with garden views and an en-suite shower room. A few steps away from the guesthouse, and sharing its furnished sea-view terrace, is one of the two independently accessed double-twin bedrooms with en-suite shower room. Lastly, accessed from a path running below the terrace is the second independent double-twin bedroom, also with its own en-suite shower room. Outside: Panayia View's gardens stretch all along the front of the property and overlook the olive groves, the sea, Panayia Island and, in the distance, the Greek mainland. Outside the main house is a fabulous sea-view terrace, partly shaded by olive trees. Other terraces on either side of the main house are accessed from the bedrooms and ensure that there is plenty of space for everyone to find their own perfect spot. A rosemary, lavender, agapanthus and cactus-lined path leads from the main house's front terrace both left and right. To the right it leads, via some steps down, to the lovely pool area encircled by whispering olive trees. To the left it runs to the guesthouse and one of the independent twin bedrooms, which are served by their own sea-view terrace, furnished for sitting and dining. The access to Panayia View includes around 500m of unpaved road. The walk into Gaios Town is about 1km (about half of which is along an unmade road) and includes quite a steep a descent into town (not a problem on the way, but worth thinking about for your uphill return). There are quite a few drops in the grounds so we recommend that younger children are supervised by an adult when exploring the property. The main house and the guesthouse have split-level areas, meaning that there are a few steps to negotiate when moving between the various areas. For guests arriving in Corfu on a morning flight, a taxi transfer from Corfu Airport to Corfu New Port and the hydrofoil crossing from Corfu New Port to Gaios on Paxos are included in the rental fee for clients staying at Panayia View. If your flight arrives in Corfu in the afternoon/evening after the last hydrofoil has left, a taxi from Corfu Airport to Corfu New Port is included, but a private sea taxi is not (however, we would be happy to organise for you). In this case, the return leg from Gaios harbour on Paxos to Corfu Airport for your flight home is of course still included. 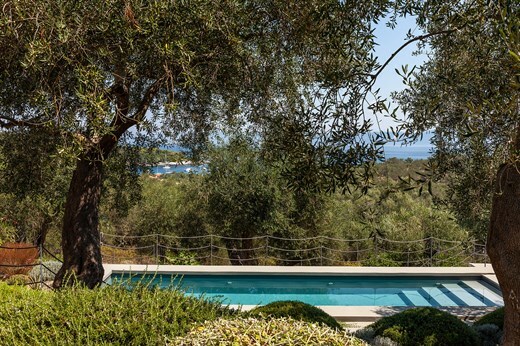 Panayia View sits in a slightly raised position looking out to sea and the east coast of Paxos. Surrounded by rustling olive groves it offers seclusion and privacy while still being within walking distance of the bustling village of Gaios. Indeed, a 15/20-minute walk will take you from the villa's gates down the hill to the harbour with its seafront tavernas, shops, cafés, beach and boat hire opportunities. The picturesque little ports of Lakka and Laggos are also close by and worth a visit either by car or by boat. Gaios is the port of entry and departure, and also has frequent boat services to Corfu and Paxos' tiny sister island, Antipaxos. "This was the best holiday we’ve had in many years. The design of Panayia View worked perfectly for our family and everyone was so happy. My grandchildren have not stopped talking about it since." This was the best holiday we’ve had in many years. The design of Panayia View worked perfectly for our family and everyone was so happy. My grandchildren have not stopped talking about it since.